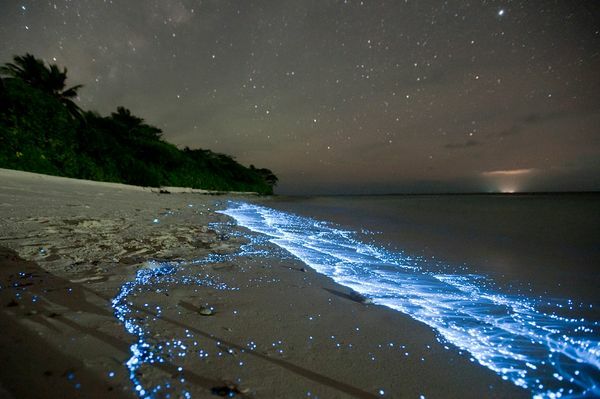 Pinpricks of light on the shore seem to mirror stars above in an undated picture taken on Vaadhoo Island in the Maldives. The biological light, or bioluminescence, in the waves is the product of marine microbes called phytoplankton—and now scientists think they know how some of these life-forms create their brilliant blue glow. “I’ve been across the Atlantic and Pacific, and I’ve never seen a spot that wasn’t bioluminescent or a night that [bioluminescence] couldn’t be seen,” Hastings said. The most common type of marine bioluminescence is generated by phytoplankton known as dinoflagellates. A recent study co-authored by Hastings has for the first time identified a special channel in the dinoflagellate cell membrane that responds to electrical signals—offering a potential mechanism for how the algae create their unique illumination.